Paratha is the most common breakfast dish in punjabi families. There are a variety of paratha made for breakfast. Here I have chosen the paneer paratha / paneer stuffed paratha. This is best suited for kids lunch box. The paneer paratha is basically a whole wheat flat bread stuffed with less / more spicy paneer (crumbled / grated) and then shallow fried with oil / ghee. The paneer used in the paratha can be of store brought / homemade. In this dish the paneer retains its freshness as well as softness even after cooking too. It can be had with some curd / any type of pickle. Take wheat flour, salt and oil (2 tbsp) in a bowl. Mix well, then start adding small amount of water incrementally and knead into soft and smooth dough. Cover it and let it rest for 15-20 min. Meanwhile prepare the stuffing. Take all the grated / crumbled paneer in a separate bowl. Add in red chili powder, garam masala powder, finely chopped green chilies, chat masala / amchur powder / lemon juice, finely chopped coriander leaves and salt. Mix very well so that everything uniformly incorporate. Divide the mixture into 6 equal portion and keep aside. Again knead the dough to smooth it out a bit and then divide into 6 equal portion. Make smooth round balls and press each one on rolling board to give shape like a pattie. Take one dough pattie, sprinkle some wheat flour over it and then roll into approx. 4-5 inch diameter circle. Put 2 tbsp stuffing in the center and seal it by gathering the edges into the center completely. Flatten it using hand, sprinkle some flour over it and roll again into 6 inch diameter circular paratha. Heat a tawa to fry the paratha over medium flame. Put the rolled paratha on hot tawa. Flip the paratha when one side is partly cooked. Apply oil / ghee on this side with a spoon. Flip again and let the ghee side get cooked now. Apply some ghee on the top. Flip again, gently press the paratha specially the edges with a spatula and cook for some more seconds. Flip and cook till the paratha has golden spots on both sides and is evenly cooked. Take out from the tawa and store in a roti basket. Repeat the same process for rest of the paratha dough. 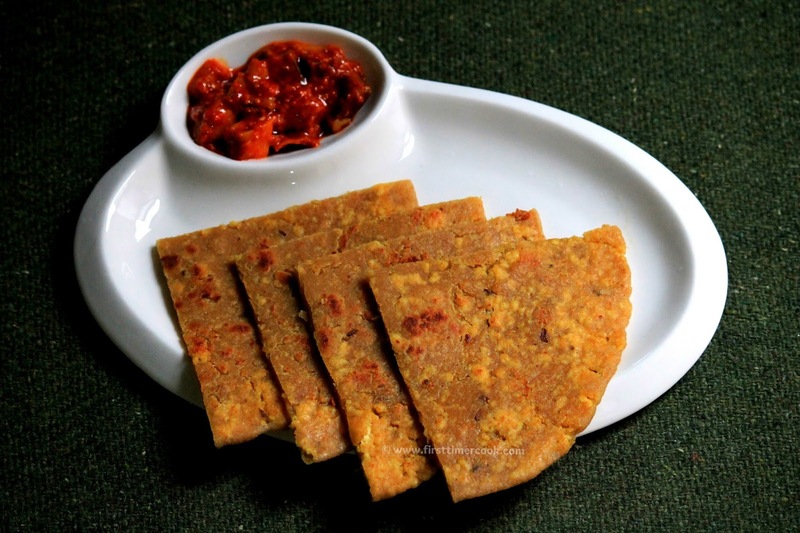 Serve this delicious paneer paratha with any type of pickle / simply with curd ! Always avoid making the dough hard, otherwise the paratha will become hard. Roll the paratha (mainly any stuffed paratha) gently to avoid from tearing. Sprinkle wheat flour while rolling paratha as less as possible.